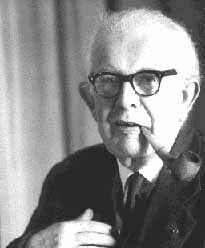 Jean Piaget (August 9, 1896 - September 16, 1980), a professor of psychology at the University of Geneva from 1929 to 1954, was a French Swiss developmental psychologist who is most well known for organizing cognitive development into a series of stages. Piaget's theory supposes that people develop schemas (conceptual models) by either assimilating or accommodating new information. These concepts can be explained as fitting information in to existing schemas, and altering existing schemas in order to accommodate new information, respectively. Although some of Piaget's ideas are similar to those of Lev Vygotsky, Piaget was apparently unaware of Vygotsky's work. Originally a marine biologist, with a specialization in the molluscs of Lake Geneva, he embarked on his studies of developmental biology when he observed the way his infant daughters came to grips with and then mastered the world around them. Piaget's theories of psychological development have proved influential. Among others, the philosopher and social theorist JŸrgen Habermas has incorporated them into his work, most notably in The Theory of Communicative Action. Piaget also had a considerable impact in the field of computer science. Seymour Papert used Piaget's work while developping the Logo programming language. Alan Kay used Piaget's theories as the basis for the Dynabook programming system concept, which was first discussed within the confines of the Xerox Palo Alto Research Center, or Xerox PARC. These discussions led to the development of the Alto prototype, which explored for the first time all the elements of the GUI, or Graphical User Interface, and influenced the creation of all of the user interfaces which were to appear in the 1980s, the 1990s and beyond. Piaget authored of The Child's Conception of the World (1926), The Origin of Intelligence in Children (1936), The Early Growth of Logic in the Child(1958).